Obtaining inquest records from Cook County requires persistence. I would like a copy of the inquest record regarding Herman Mangels, my 2nd great-grandfather. I am willing to pay reasonable copy costs or fees. Please let me know what those are so I can reimburse you for any expenses incurred by my request. My contact information is below. After my signature, I added my physical address, my email address and my phone number. I am writing to follow-up on my July 30th request for a copy of the inquest record regarding Herman Mangels, my 2nd great-grandfather. This letter is to inform you that I am in receipt of your correspondence dated August 20, 2012. All the old Coroner records are housed in a Cook County Warehouse. With that being said, to date, I have done two (2) searches of the warehouse to locate the inquest on the above named individual. Usually, five (5) attempts are done on any given inquest. I usually try [to] get to the warehouse once a week. Once I find the record, you will be billed. Per Public Act 096-1161, passed by the State of Illinois in July 2010, the charges for Coroner’s Inquest is five ($5.00) dollars per page of sworn testimony. If the record cannot be located, you will be notified as well. On Friday October 26th I opened my mailbox and found a large envelope from the Office of the Medical Examiner, County of Cook, Dr. Robert J. Stein Institute of Forensic Medicine, 2121 West Harrison Street, Chicago Illinois 60612-3705. Tomorrow I’ll share the contents. Thanks for all the information you have supplied. I am off to write my own letter. So glad I could be of help – best of luck to you! I am going to request a coroners inquest report and was looking for info on how to do that, thank you for your posting. I see this was written in 2013? It’s now 7/11/2017 and wondering if anything has changed in regard to this process, and writing to see if anyone would know? Thank in advance for any suggestions and or prayers or good thoughts! I really want to know what happened with my grandfathers. I hope you received the coroner’s report you were seeking. Did it answer many questions for you? Laura, How many pages were in the inquest report? Page numbers will vary due to the number of witnesses, the length of their testimony, the contents of the medical examiner’s report and so on. Each case is different, but (in my opinion) all are worth pursuing if the deceased is in your family tree. I read this story with great interest. I found this because I was searching where to find coroner’s inquest records in Chicago. My grandfather was killed by a hit and run driver April 28, 1933. He was waiting for a bus when a speeding car hit him with great force. I have the Coroner’s death certificate that explains his injuries but it does not tell me a lot of where and when this happened. I have written the Chicago Police Department but they indicated they no longer maintain traffic accident reports before 1994. Maybe i tried the wrong dept. I am going to try your method. Any suggestions? I really would like to know the specifics surrounding that accident. At the minimum the where and when. Hi Gloria, thank you so much for stopping by where2look4ancestors! Because of the circumstances of your grandfather’s death, there should have been an inquest. His death certificate will say whether or not one was conducted. I would also think the newspaper (the Chicago Tribune and/or the Daily News) would have reported the incident. Have you had any luck looking there? I don’t know of an official form for inquest report requests, but a letter should suffice. In my own request I tried to stay brief but give enough details such as the name, date and place to help them in their search. As you read in my post, those older records are a challenge for the staff to retrieve. 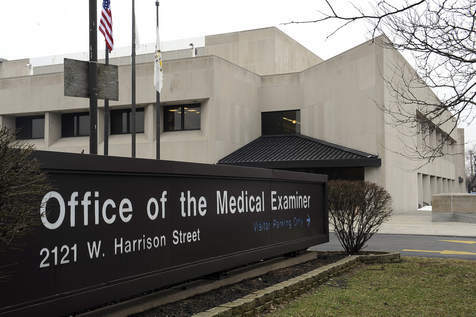 Address your letter to the Office of the Medical Examiner, County of Cook, Dr. Robert J. Stein Institute of Forensic Medicine, 2121 West Harrison Street, Chicago Illinois 60612-3705. Please let my readers and me know how you fare – we wish you luck in your quest! Thank you for sharing this. I am going to embark on my own search for similar records. I’m glad the information was helpful to you Ken – best of luck to you!